RIO DE JANEIRO, Jul 2 2013 (IPS) - After 10 years of social and economic gains thanks to successful employment and public investment policies and anti-poverty programmes, Brazil is facing the challenge of broadening and accelerating a model of development that includes, for instance, the young people protesting on the country’s streets. Since the leftwing Workers’ Party (PT) came to power in 2003, first under Luiz Inácio Lula da Silva (2003-2011) and then President Dilma Rousseff, major strides have been made against poverty. In June 2011, when the Brazil Without Poverty (Brasil Sem Miséria) plan was launched, official statistics acknowledged there were still 16.2 million people living in extreme poverty in this country of nearly 200 million people. But conditional cash transfer programmes like Zero Hunger (Fome Zero) and family allowance (Bolsa Família), job creation strategies, higher wages and access to micro-credit, together with heavy investment in major infrastructure works, have achieved significant results. The subsequent process of upward social mobility “should not be under-estimated,” said Leonardo Avritzer, a political analyst at the Federal University of Minas Gerais. 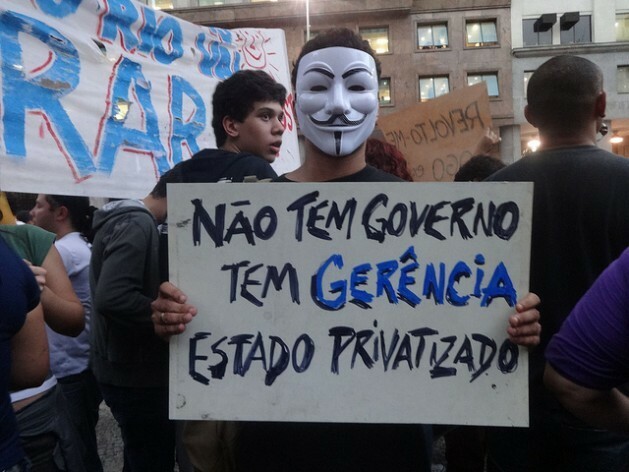 “The protests in Brazil today are not questioning the considerable progress made in the last 10 years. The 40 million people who were lifted out of poverty and the narrowing of the inequality gap are real advances,” he told IPS. However, it is time to expand and extend these policies, he said. “The root cause of the demonstrations is, in the first place, the slowing rate of reform and a certain distancing of President Rousseff from the social movements. But it is important to note that those demonstrating these days are a group of young people from the middle classes. And they are protesting over a number of urban issues,” Avritzer said. Their demands include basic questions such as better education, health care, urban transport and infrastructure. In the case of the “favelas” (shanty towns), where there is also a growing middle class that is beginning, timidly, to join in the demonstrations, the demands are for basic sanitation, paved streets and day care services for the children of working mothers. Programmes like Caring Brazil (Brasil Carinhoso) and My House, My Life (Minha Casa, Minha Vida), dealing with child development and housing, respectively, are aimed at improving these problems and “consolidating” the new middle class, Maurício Santoro, a political analyst and adviser to Amnesty International, told IPS. “Brazil has made strides in terms of wage increases and income transfers for the poorest population, and ensured access to consumer goods and housing. But there is still a long way to go before people can actually overcome their exclusion from full citizenship rights,” Santoro said. Avritzer said that this is one of the “real questions” today. “Brazil has undergone many changes, and access to education and health systems nowadays is universal,” he said. “However, the services are of poor quality. Part of the so-called ‘new middle class’ is trying to find better services in the private sector, but this has led to higher prices. Access to high quality public education and health care is one of Brazil’s main problems,” he said. These are precisely the demands being voiced in the streets of Brazil’s main cities. And it is no coincidence that the spark that lit the flames of protest was the problem of public transport. Economic growth and easy credit for car purchases, for instance, have doubled the size of the country’s vehicle fleet to over 60 million automobiles that are jamming the streets, without a strategic plan to improve roads or to expand alternative mass transportation systems like subways and long distance trains. Orlando Santos, a sociologist and urban planning expert at the Federal University of Rio de Janeiro, drew particular attention to the situation in this city, Brazil’s second largest, after São Paulo. “Large road systems are being built without taking into account the integration of the city with its outlying areas. This kind of planning is absolutely irrational and misguided, wasting public resources and reflecting the subordination of the municipal government to powerful economic interests,” Santos told IPS. “Construction of the metro (subway) is advancing at a snail’s pace. In the absence of popular pressure, municipal governments have connived with business people in the industry. Public policies favour automobiles,” he told IPS, calling this the “mercantilisation” of transport. “The voices in the streets are clamouring for rights, not consumption; they want public and private services, and a social welfare state, not a minimalist state,” he said. The protests indicate the failure of the conservative vision that targeted policies are all that are needed to attain “social welfare,” he said. An expert with the Inter-Trade Union Department of Statistics and Socioeconomic Studies (DIEESE), Mineiro sees three phases of development as promoted by Lula and Rousseff. So what are the people in the streets complaining about? IPS asked. “When it comes to a social welfare state (health, education, transport and sanitation) there is still an awful lot to be done, and the emphasis again this year on budget tightening puts those sectors even more at risk, exacerbating the problems and provoking discontent,” Mineiro said. “The (Rousseff) administration has returned to the logic of international insertion, competitiveness and budget adjustment, and is attempting to reconnect with global markets that have been in decline since the crisis, which has curbed the dynamism of economic growth,” he said. Avritzer said, finally, that the progress of this model does not depend on a high rate of economic growth, but on “appropriate policies” that lead to an improvement in services. In Fagnani’s view, “the protests provide a new opportunity for confronting political, social and economic underdevelopment that has been aggravated by the long-lasting neoliberal experiment.” The lesson to be drawn, apparently, is: having put your hand to the plough, don’t look back.